I own an iPad and debated between the Mini and the Nexus 7. I went with the Nexus 7. Without rooting, I can copy files from camera to external hard drive without resorting to wifi or buying anything extra. GPS, turn by turn voice navigation, offline maps, easy integration with Google tools like Mail, Picasa Web, YouTube, etc... I can see why someone would want a wider screen, but the narrower N7 can fit in more pockets and make for easier holding on the train. And in general, there is much more detail in settings. The N7 is sorely missing a rear facing camera. I like to photograph articles, documents, basically text. The 1.2 megapixel front facing camera is not enough to capture text clearly. The build quality is a little suspect, for example, the screen lifting problem. Jelly Bean, in general, may be more buttery smooth than its predecessors, but it is much easier navigating iOS, selecting text, scrolling, etc... iOS is much more responsive. Obviously iOS app selection is better, but I notice that Android equivalent apps are not as good. For example, the Kindle app on iOS, when you highlight a word on the bottom of the screen, the definition appears on the top, which allows you to alter the highlighting selection. The Android version, the definition covers the bottom so you can't change the highlighting selection. I noticed other instances of how the iOS app works better than its Android equivalent. Dropbox, Evernote for example. Google Play has a limited selection of movies and tv shows compared to iTunes/Amazon. So my use case for the big iPad is reading music scores from the piano, reading books with complex formatting, reading novels at home - fewer page turns, videos and apps I can't get on Android. The N7 for everything else. I went to an Apple store today (Black Friday) planning to buy a 4th-gen iPad on sale. Though I hadn't yet seen a mini, I dismissed it out of hand because I "wanted a retina display". It happened that there was a mini next to a iPad 4 on display, so I compared them. The resolution difference wasn't really obvious to me (after all, the mini has a higher pixel density than the iPad 2), and in reading text (web pages, for example) I felt no clear preference. The mini's display was somewhat yellower/warmer than the 4's, which I didn't much care for. However, I opened Apple Maps on both, and was shocked to see that that the mini had a MUCH clearer display than the 4. On the mini, the smallest streets were clear at the zoom level where they appeared, but on the 4 they were so washed out as to be almost invisible. And in pretty much every other respect, the mini's Maps display looked better. I spent half an hour mucking with brightness and zoom levels trying to equalize the displays for a fair test, but no matter what I did the mini display was dramatically better. 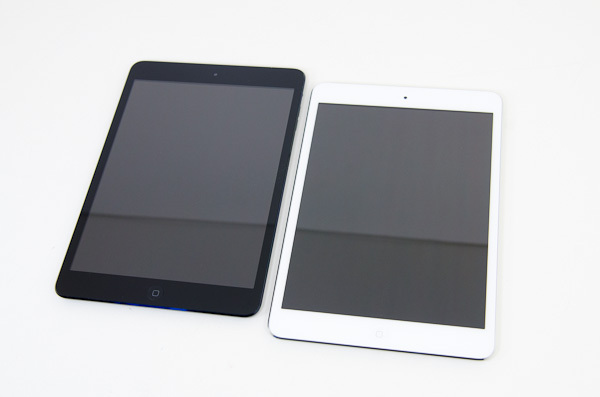 So, I tried an iPad 2 next to a 4, and got exactly the same results. The 2's display looked very much like the mini's (albeit larger), with map details much clearer than on the 4 (a *different* 4 from the one I compared to the mini, so this wasn't just a sample glitch with that particular iPad). I called over a store rep and showed him my results. He said "Hmm... but the Retina Display is better on things like photos and videos. Watch..." and he brought up the same sample image on both. We were both surprised to see that the image on the 2 was again dramatically nicer (less washed out, in particular) than on the 4, and at that point I realized that the real difference is that the 4's display has rather poor contrast (for which there is no adjustment), which would account for all the differences I observed. I very much prefer the Retina Display on my iPhone 4s (and my wife's 5) over the previous ones, but on the iPads it seems to be significantly flawed (at least with the two samples I tried). I left the store with an iPad mini, even though it was the only iPad not on sale today. I had the iPad 2 for a while and sold it as too large to take it with me daily. I purchased the wifi 32GB black model. It is the apps available for iOS that make the iPads attractive. I use n-Stream for Naim network player, use it as remote with Logitech app. Skype works well, Textplus for free texting nice. Even with Targus case Mini iPad fits inside pocket of winter jacket when walking, hopefully once summer comes around I find summer jacket with large enough inside pocket. You wrote "It pains me to say it, but compared to most similarly priced notebooks, the iPad mini's display is amazing." The problem of going the Full Retina Display Route is that that is an even ultra higher resolution than the iPad 3-4. And the battery and GPU needed would make it heavier, larger, and more expensive. This is thus not the route. These are also all reasons the iPad and iPhone can't have retina displays. If you give someone $5 they will ask "why didn't you give me" $10. Just the fact that most applications that a few years ago could only be performed on a desktop or laptop are now being implemented in handheld devices is freaking awesome!! who cares about the minor dimension differences in between the devices.